This stylish contemporary media console will be a functional addition to your living room or family room. The glass top surface has a unique shape, with gently curved front and back, and straight sides. Place your TV on top of this stand, and use the two lower glass shelves for electronics components, movies, and other media items. The sleek Black metal frame is simple and sophisticated, with a back support featuring a cord hole for easy access. 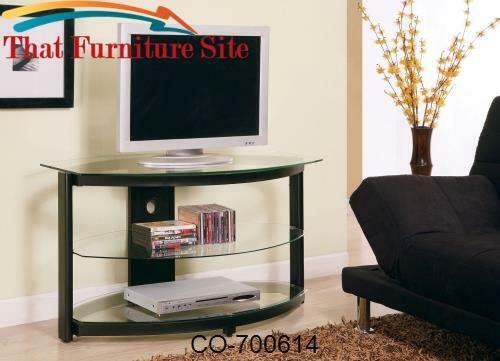 Add this TV stand to your home for the perfect blend of form and function.